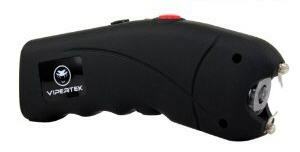 8 Best Stun Guns For Self Defense and Our Winning Pick! Stun guns are one of the best options for self defense today because they are easy to conceal, they are effective at temporally disabling your attacker so you can get away, most are reliable, and they are low cost. A stungun is a device that generates "electric noise" and makes the nervous system feel pain or discomfort. It usually causes short-term paralysis of muscles and leaves a body motionless for some minutes. 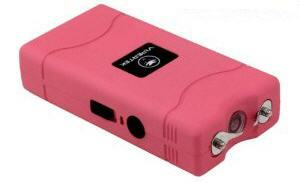 Stun guns do not normally cause any long-term damage or side effects. But to be safe, check with the manufacturer for specific health and safety risks. Also find out if they are legal in your state our country before buying or using one. 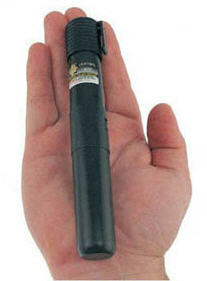 Stun guns usually come in different shape and size. 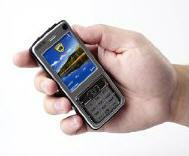 You can have a stun gun that looks like a cell phone, pen, battery, and etc. 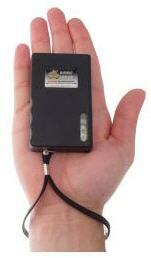 Despite its size and shape, a small device can deliver a million volts that is enough to immobilize the attacker. The prices range from $14.95 to $1000. In other words these effective self defense weapons are available for everybody even if you have a low budget. The Streetwise Blackout 5 Million Rechargeable is one of the best-sellers today. The device is compact in size that makes it easy to keep the stun gun in a pocket or a handbag. You can carry it wherever you go. This model weights only 7oz. The Streetwise Blackout has rechargeable batteries and charger built in it that means you do not need to change batteries from time to time and it will be always ready to use. The built-in LED flashlight enables you to see wherever you go in darkness. This model cannot be used against you if an attacker manages to grab it away from you. But you have to leave the strap with you because it is the disable pin. Once this pin is out it cannot be used. 5 million volts may seem too strong but it should not cause any long term, harmful effects. The Guard Dog Cell Phone is a great little unit. It's our third place winner! Here's why: It looks like a cell phone, and feels like one so it can catch your attacker un-aware which gives you an advantage. It packs 2,700,000 volts so it's on the low end of most stun guns, but it should be effective. It uses a rechargeable battery which is simple to re-charge, using any wall plug in. In addition it comes with a carry case (not the best case in the world though). 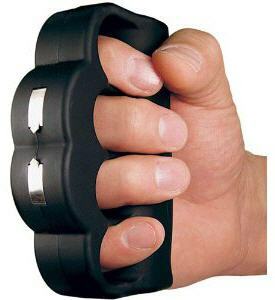 The Knuckle Blaster is a unique shape and fit for your hand, giving you more grip and accuracy for use in self defense. It's very powerful and reliable. According to the manufacturer, if you keep it in contact with an attacker for a longer period of time they will become disorientated and come to their knees. But this can be said for just about any stun gun. It comes with two Lithium batteries, and a belt holster made of nylon which can make it easy to access. In addition, it has rubber skin which is soft, and it is sized to fit all hand sizes. Also, the added safety switch is good in case someone you don't want using it tries to get hold of it. The VIPERTEK 7,800,000 Volt Mini is one of my favorites because it packs 7,800,000 Volts, and it's really cheap. It's our second place winner! You can't go wrong with it. The sound of this little unit alone can halt an attacker in his tracks. But of course, some attackers keep on coming, and if that is the case a little taste of this little guy should bring any attacker down in two seconds. And at only around $14.95, it's a great buy, and it will fit in any purse or hand bag. WINNER: VIPERTEK 8,800,000 Volt Mini is exceptional, and it's our favorite overall. It is very similar to the 7,800,000 version above but it's a little more powerful. It too will bring most attackers down in just two seconds. The added bonus is it comes with a LED flashlight which is really handy. Imagine you hear a noise in your house, or out in the barn. Would you rather carry a regular flashlight or a LED flashlight stun gun that can bring an attacker down instantly? At just $16.95, it's a no-brainer. 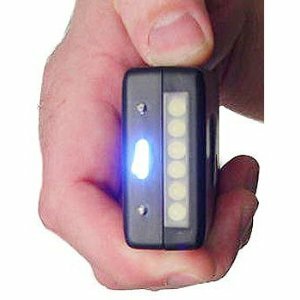 One of the top rated stun guns is Streetwise 1.5 Rechargeable Stun Pen that is easy to operate with the help of off/on button. The device is too light and small in size. So, there is no any difficulty to carry it always with you. You can put it into your handbag, purse, briefcase, pocket, or even attach to your belt while jogging or do exercises somewhere far from the settled place. This model is hand-sized that makes it very convenient. One of the great features is its look. It looks like an ordinary penlight flashlight that makes it unremarkable for potential attackers. This model also have built-in flashlight and can be used for different reasons, too. The Blackout mini is also very good, is small, though size does not have negative influence on its capacity, and it can deliver 1 million volts. This device is equipped with rechargeable batteries which need to be recharged only for 8 hours every 60 days. Another good feature is the 6 LED lights. No need to say that it is easy to carry the device with you due to its size and weight. These features make a list of the best stun guns for self defense for almost anyone, everywhere (in states our countries that they are legal in). They help women, children, and even men feel safe while being in dark, lonely, and scary places.